Born in Cowley, Oxford on 8th November 1866, George Bertie Parker was the only son of George Parker (1833–1900), who for many years was Clerk of the University Schools at Oxford, and Sarah Ann Parker (née Broadhurst) (1844–1934). Educated at New College School, Oxford, and later as a boarder at Lord Williams’s Grammar School, Thame, Oxfordshire, he matriculated as a Commoner (BA Queen’s College) in 1885. He joined the Horse Guards on 20th September 1888, but purchased his discharge 23 days later. George rejoined the Horse Guards on 30th May 1892, this time staying for nearly two years. According to the ‘Liber Vitae Reginensium’ (Queen’s College archives), he left university to enter the service of the British South Africa Company, became the Postmaster of Fort Tuli, and was selected to lay the telegraph from there to Fort Victoria. Later he was sent by Mr Cecil Rhodes to Buluwayo to organise the Matabele Police. He served in the Boer War, first as a Trooper with the Mounted Police of the South African Constabulary and then at age 30 he joined B Troop of “Jameson Raiders” where he served as a Corporal, but giving his address as St Giles, Oxford. He is then recorded as a Sergeant in Loch’s Horse joining on 10th February 1900 and being invalided back to England on board SS Canada on 1st August 1900. In April 1909 he sailed from London on the SS Ionic, arriving at Lyttleton, New Zealand, in November of that year. 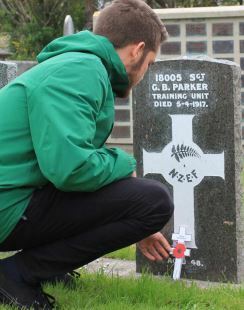 He worked as a clerk for A J Gibbs in Forton, New Zealand until September 1915 when he enlisted with the New Zealand Expeditionary Force – taking five years off his age. He served on the home front at Featherstone Camp, Army Supply Corps and was promoted Sergeant in April 1916. He died from throat cancer at the Victoria Military Hospital, Wellington, New Zealand, on 5th April 1917 and was buried at Karori Military Cemetery in Wellington. It is particularly appropriate that the Thame Remembers cross was laid by George Bateman, who was himself Head Boy at Lord Williams’s School in 2006/7.